After five years of development work, Rittal will be unveiling its new large enclosure system at the 2018 Hanover Trade Fair for the very first time. Highlights of the innovative inclosure include the new base/plinth system, the support arm system CP, with new height-adjustable support section for machine operations, and smart solutions for cooling enclosures, machinery and IT, as well as the new Secure Edge Data Center. Besides the premiere of its new large enclosure system, Rittal is presenting the new integration solution – a symbiosis of enclosure and cooling unit – and a Ri4Power application for low-voltage switchgear. According to a press release from Rittal, these show that the benefits of the new large enclosure system are not only in the enclosure itself, but in the systemic interaction with the cooling unit and the power distribution components. Another highlight to be seen at the booth is the new base/plinth system, combining all the advantages of the existing TS 8 and Flex Block base/plinth systems in one solution. It greatly simplifies the mounting of the base/plinth and also integrates other functions such as the secure mounting of cables using standard punched sections. Other new products from Rittal include the support arm system CP, with new height-adjustable support section for the ergonomic arrangement of a panel or control components on machines and systems, as well as the completion of the range of LED system lights. The new Blue e+ wall-mounted cooling units with a 1.6 kW cooling output and the Blue e+ chillers with cooling outputs of 2.5 to 6 kW ensure greater energy efficiency when cooling enclosures and machines. Rittal is making these cooling solutions able to communicate with the new IoT interface for Industry 4.0 applications. And finally, the company is launching a whole new range of IT cooling solutions for individual racks and entire data centers. The new range of products includes coolant-based cooling solutions with a cooling output of 20 kW, hybrid solutions (with indirect free cooling) with a 35-kw cooling output, as well as a new generation of water-cooled IT cooling solutions. Yet another IT innovation is the new Secure Edge Data Center. This turnkey data center solution developed by Rittal together with global partners ABB and HPE is designed to operate in tough industrial environments. With the aid of secure edge data centers, companies can now access and respond to critical data in real time. This brings IT capacities closer to the location of data acquisition and machine control. Trade visitors to the exhibition booth can also experience the value chain in control and switchgear engineering from an industrial 4.0 perspective. The Rittal Automation Systems Business Unit supports workshop processes – from manual tools to fully automatic systems – with its range of solutions. 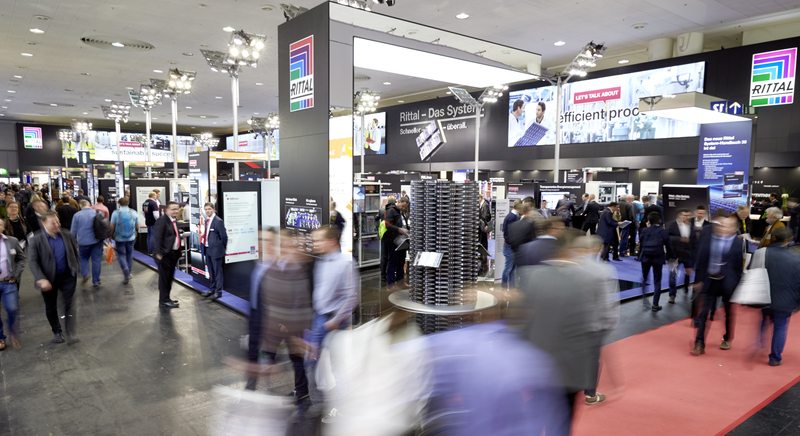 The Smart Engineering and Production 4.0 technology network of Eplan, Rittal and Phoenix Contact at Hanover Trade Fair 2018 (Hall 8, Booth D28) will also be providing answers to the question of how industrial engineering and production processes can be completely digitized. A live demonstration using the example of a switchgear installation will show visitors what highly automated manufacturing based on a batch size of 1 works. At the 2018 Hanover Fair, Rittal’s sister company EPLAN will be presenting the first glimpses into the upcoming version 2.8 of the EPLAN platform in Hall 6, Booth H30. This offers surprises with decisive innovations in ergonomics, which will not only accelerate engineering even further, but also advance automation and standardization through extensions of macro technology.